Sad news today that the great Richard Baker, who introduced the first BBC TV news bulletin in 1954, has died aged 93. Baker will be a familiar face – and voice – to anyone who grew up in the ’60s, ’70s or ’80s and of course took part in that wonderful Morecambe and Wise song and dance routine in 1977. He also has a long association with classical music and Last Night of the Proms. His BBC colleague John Simpson said this. 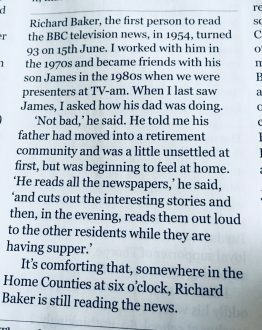 And his passing reminded us of this lovely story, shared a few months back by Terence Dackombe on Twitter, of how he settled into the retirement home where he spent his last few years. And here he is introducing the news back in 1954. RIP Richard Baker. Our thoughts go out to all his family and friends.